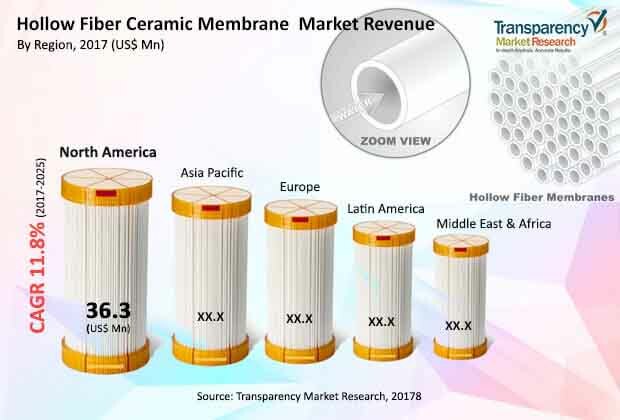 The global hollow fiber ceramic membrane market was valued at around US$ 99.0 Mn in 2016 and is anticipated to expand at a CAGR of over 11.0% from 2017 to 2025, according to a new report published by Transparency Market Research (TMR) titled ‘Hollow Fiber Ceramic Membrane Market – Global Industry Analysis, Size, Share, Growth, Trends, and Forecast, 2017–2025.’ Expansion of the global hollow fiber ceramic membrane market is driven by increased utilization of hollow fiber membranes (HFCMs) by municipalities and declining membrane cost and installation expenses. The hollow fiber ceramic membrane market in Asia Pacific is expected to expand at a CAGR of over 14.0% during the forecast period. Favorable government regulations, development and expansion of new plants by global manufacturers, increased demand for freshwater, and inflated prices of clean water are fuelling demand for water treatment, which, in turn, is likely to propel the hollow fiber ceramic membrane market in the region. Rise in global population has fueled the requirement for clean, safe, and potable water, which, in turn, is increasing demand for wastewater treatment. All the wastewater from large cities and towns is generally collected through sewers and sent to a municipal wastewater treatment facility. The reuse potential of hollow fiber ceramic membrane effluents is high with most membrane systems providing superior quality reusable effluents. Most of the treated water can be directly utilized for municipality purposes or even be safely dumped in the sea without violating environmental norms. HFCMs are ideal for use when smaller spaces are available and the need for high quality treated water fit for reuse is high. Demand for high quality treated water from municipalities is rising at a steady pace owing to the increase in population. This is driving the hollow fiber ceramic membrane market. In terms of application, the hollow fiber ceramic membrane market can be divided into ultrafiltration, microfiltration, and nanofiltration. The microfiltration segment is anticipated to dominate the market during the forecast period. Ultrafiltration and microfiltration membranes are primarily made from alumina, titanium oxide, and zirconium oxide. These materials can withstand high temperatures and harsh chemical environments, making membranes made from these materials ideal for use in the dairy, food, pharmaceutical, biological, paint, paper, and water industries. The nanofiltration segment is anticipated to expand at a significant CAGR of over 13.0% during forecast period, owing to the current boom in the water & waste water processing & pharmaceutical industries increase in disposable income, and technological advancements. Nanofiltration membranes are used in various industrial applications and are also used for the concentration of sugars, dyes, and other substances. In terms of end-user, the hollow fiber ceramic membrane market can be classified into biotechnology, chemical processing, water & wastewater processing, pharmaceuticals, and food & beverage processing. The water & wastewater processing segment dominated the hollow fiber ceramic membrane market in 2016. The trend is expected to continue during the forecast period. The food & beverage processing segment is likely to follow the water & wastewater processing segment in terms of market share during the forecast period. The segment is anticipated to hold more than 15.0% of market share in 2016. Expansion in the segment can be attributed to a robust food & beverage industry. In terms of region, the global hollow fiber ceramic membrane market can be categorized into North America, Europe, Asia-Pacific, Latin America, and Middle East & Africa. Asia Pacific is anticipated to hold a major share of the market owing to lucrative expansion opportunities in the region, increasing regulatory interventions in China, South Korea, and Japan, and unremitted urbanization in China. The market in North America was valued at around US$ 33 Mn in 2016 and is expected to expand at a moderate pace during the forecast period. Key players operating in the hollow fiber ceramic membrane market are Technology Inc., Atech Innovations GmbH, CoorsTek, Inc., MICRODYN-NADIR GmbH, Nanostone Water, Inc., Koch Membrane Systems, Inc., TAMI Industries., Qua Water Technologies Private Limited, Ceraflo Pte Limited, and i2M LLC. Companies are focusing on new product development and expansion strategies. For instance, in 2017, Nanostone Water, Inc. introduced a unique high surface area ceramic ultrafiltration membrane for municipal water/wastewater and industrial water treatment. Global manufacturers such as Tianjin Motimo Membrane Technology Co. Ltd. and Beijing Origin Water Co. Ltd. are expanding new plants.